The iconic retail company Wal-Mart is the No. 1 among all Fortune 500 companies for the second year in a row. The top retail company recorded $421 billion in sales. Wal-Mart's earnings were $16.4 billion. Oil giant Chevron remained at the No. 3 slot with revenues of $196 billion. Giant holding company Berkshire Hathaway jumped four places on remain at to No. 7 in the fortune 500 companies list with revenues of $136.2 billion. Pay-TV provider DirecTV (No. 110) jumped six places on the list as revenues rose to $24.1 billion. Automaker General Motors rose to No. 8, despite having emerged from bankruptcy only in November. Two homebuilders made the list despite a national foreclosure crisis. Destitute ward of the government, Fannie Mae, lost more than $14 billion last year but sprang to No. 5 on the 500, ahead of General Electric. Fortune 500 list of top companies around the world is compiled annually. Fortune 500 companies list and ranks publicly listed companies according to their revenues. 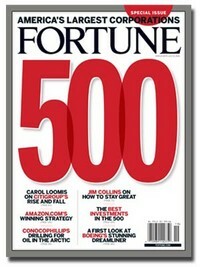 The Fortune 500 List of companies has hence become an authentic source of knowing the names of top companies around the world including companies’ revenue, profitability and ranking If you want to know which companies are the biggest, most profitable and most powerful in the world; look no further than the Fortune Global 500.